From the "Friendly City" of Bradenton, Florida, alt-folk troubadour Kristopher James channels the balanced line of life, love, doubts and hopes into "captivating music loaded with soft, acoustic guitar tunes and stunning vocals" (Music Gets Me By) ... On display in songs like "Runaways" and "My Heart Wasn't Ready" from his self-produced EP "Movement:1"
If you were able to catch Terminus Cursus at MicroGroove last night you were part of the chosen ones. Formed as a collaboration between Bradley Elston (drums) and Patrick Mugan (bass/vocals) with the original intention of featuring a rotating lineup of accompanying musicians for performances and recordings. After joining them for a show on Halloween of 2013, Arthur Mugan (guitar/vocals) was added as a full-time member. The band’s self-recorded first album, 6 6 6 6 6 6 6 6, was released by Kevin Greenspon’s Bridgetown Records on cassette in November 2014, solidifying the Terminus Cursus sound: distinctly aggressive post-punk, equally informed by the British (Echo & the Bunnymen, Joy Division, Wire) and American (Honor Role, Mission of Burma, Wipers) traditions and tempered with a smattering of more extreme contemporary reference points (Converge, Neurosis, Today is the Day). On of, the second Terminus Cursus album, was completed at Tampa’s Atomic Audio Recordings in November 2015. Besides the increased sonic clarity and detail in comparison to the debut, On of more thoroughly develops the band’s previously latent krautrock and post-rock influences while losing none of the intensity for which they have become known. A quick recap of this years Don't Stop St. Pete's 2014! 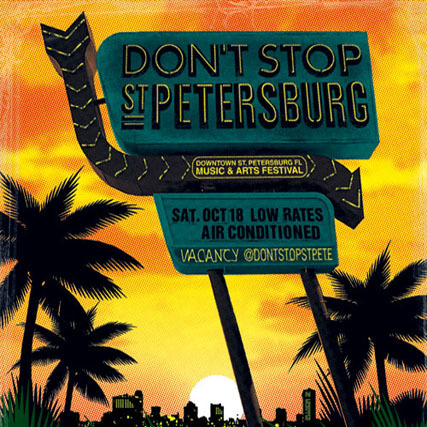 Don't Stop St. Pete is an amazing music and arts festival in St. Petersburg, FL, from the people that brought you Antiwarpt and 420 on 4/20 Festival.